Chalky and Spot, two 60-year-old tortoises who have been with their family for over 50 years, were playing around in their garden one day when Chalky decided he was feeling adventurous, and snuck out of the garden and out into the world before his family had a chance to notice. Spot tried to escape as well, but wasn’t as quick. Soon Chalky was nowhere to be found, and the two lifelong friends were separated. “The recent hot weather seems to have given Chalky and Spot a new lease of life and they’ve been very active; in fact, Spot also escaped at the same time but he wasn’t as quick as Chalky — we found him heading up our garden path,” Kate Harris, Chalky and Spot’s mom, said in a press release. The family searched everywhere they could think of to try and find their beloved Chalky, but they couldn’t find him anywhere. They were extremely worried about him, as he was an important member of their family, and no one was more upset than Chalky’s 9-year-old sister Ella. Ella couldn’t stop looking for and thinking about poor missing Chalky, and then she had a fantastic idea — she decided to make missing posters. 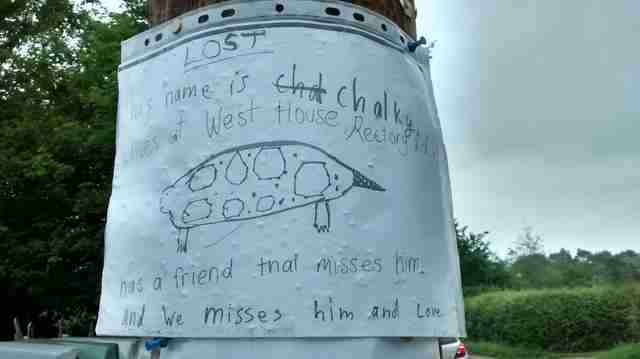 “It was her idea to draw a lost poster and she spent lots of time getting the picture just right, before we walked around the village pinning them up, hoping they would help Chalky be found,” Harris said. The hand-drawn posters seemed like a long shot, and after seven days with no sign of Chalky anywhere, the family was starting to give up hope — but little did they know, the posters were about to help bring Chalky home. As it turns out, Chalky didn’t make it very far from his house, and as he was wandering along a road he was eventually spotted. 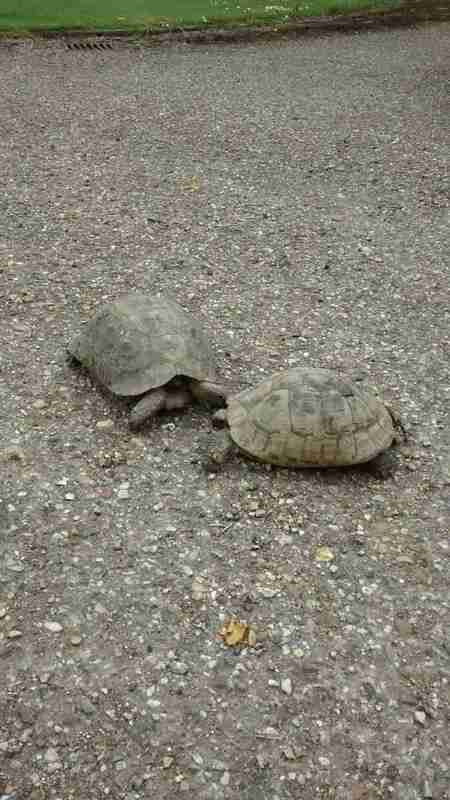 The man who found him was concerned about the tortoise being out on his own by the busy road, so he stayed with Chalky and kept him safe while he contacted the RSPCA for help. 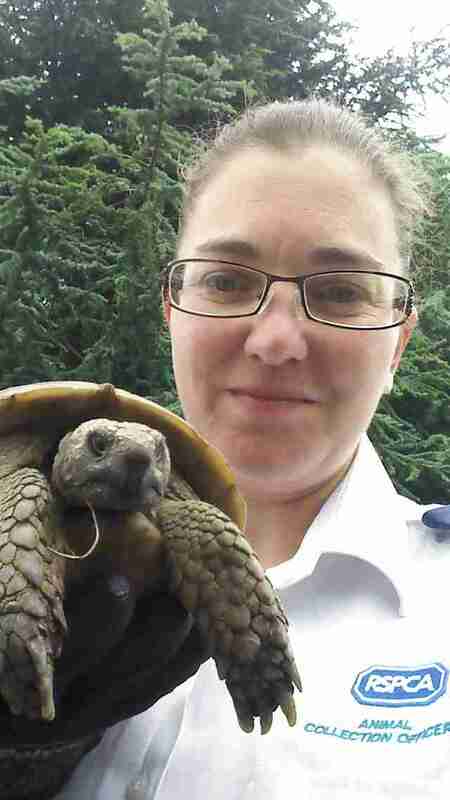 Nicola Sullivan, an animal collection officer with the RSPCA, got the call about the tortoise and drove out to collect him. 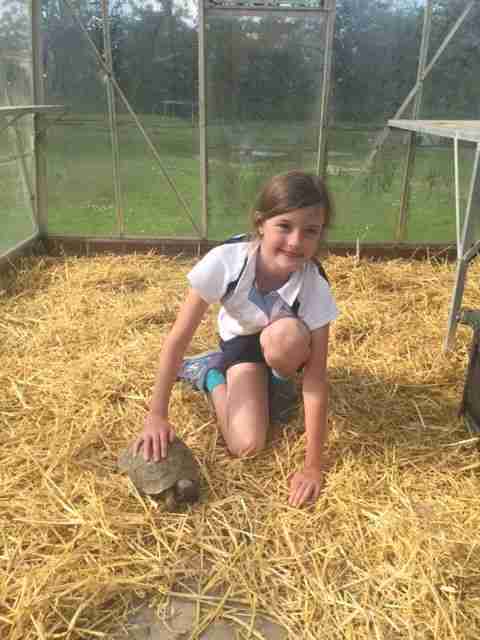 She was planning on bringing him to one of the RSPCA shelters, but on her way to get the tortoise, she spotted one of Ella’s posters and wondered if the tortoise she was on her way to help could be Chalky. Ella was so thrilled to see Chalky again, and so was his best friend Spot. Everyone was so happy to be reunited with Chalky, and Chalky seemed pretty pleased to be back too. “We’re so grateful to have Chalky brought back to us by ACO Sullivan, and it’s very lucky the man found him when he did,” Harris said.